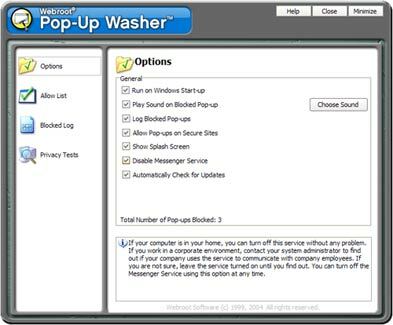 ...... Pop-Up Washer stops pop-ups at the Internet Explorer engine before they appear, preventing screen flickers common to other pop-up blockers. With one-click activation, you have the option to log blocked pop-ups. Customize which sound you want to hear when Pop-Up Washer blocks an ad. Pop-Up Washer installs quickly, operates without getting in the way of your system resources, and offers easy-to-use features that will dramatically improve your online experience. Webroot? Window Washer? simply and safely wipes your internet tracks clean. Kill internet popups with ads before they reach your eyes! It's Free! Qweas is providing links to Webroot Pop-Up Washer 2.5 as a courtesy, and makes no representations regarding Webroot Pop-Up Washer or any other applications or any information related thereto. Any questions, complaints or claims regarding this application Webroot Pop-Up Washer 2.5 must be directed to the appropriate software vendor. You may click the publisher link of Webroot Pop-Up Washer on the top of this page to get more details about the vendor.